Ben Towle is the author of the graphic novel Midnight Sun and the artist for Amelia Earhart: This Broad Ocean (written by my teacher at CCS Sarah Stewart Taylor! ), due out this February. 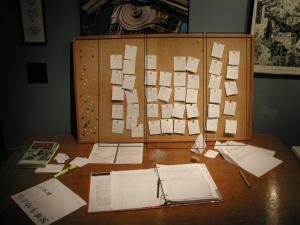 Through this blog entry, he shares his approach to the three-act structure for graphic novels using a common writing tool: index cards and a corkboard. I recommend the index card approach. It’s great to SEE your story laid out in front of you as opposed to having it all locked away in your head.